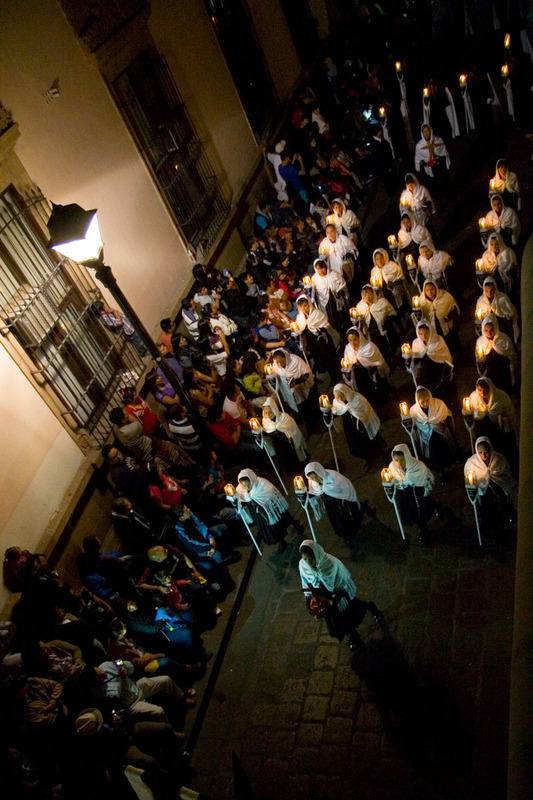 One of the reasons we wanted to travel to San Luis Potosí was the famous Procession in Silence, which recreates the Via Crucis, or Christ’s final walk to the crucifixion. While a number of towns in Mexico reenact the crucifixion and the procession, few do it in silence or at night. The one in SLP is quite dramatic, taking place just after nightfall, and the city dims or extinguishes many streetlights to enhance the drama of the marchers with candles. This tradition just celebrated its sixtieth year in SLP, and about two thousand people from twenty eight different cofradías (Catholic religious brotherhoods) meet in the Plaza del Carmen to participate in the procession. Each of the cofradías carries a representative figure or sculpture from the Via Crucis of Jesus Christ and each has its own colorful and dramatic livery, many of which are characterized by a pointed hat with a drape that covers the face and neck, called a capirote. The capirotes have an interesting tradition, well away from anything cooked up by the KKK. In the middle ages in Spain, those condemned to death were dressed in robes with a capirote on their heads, and then led to the gallows thusly dressed. During the Spanish Inquisition, those condemned for religious crimes were also similarly dressed before executions, with the addition of a sign hung around their necks detailing their crimes. For those reasons, in Spain and in Spanish-speaking countries, a capirote has become associated with disdain, disapproval, mockery, and derision. Incidentally, we also have shades of that in the Anglo world with the dunce cap. In the Procession of Silence, by wearing such a hood the penitents are attempting to put themselves into Jesus’ position as he was marched to Calvary, lugging the cross on his back, mocked and jeered by the crowd. It’s an interesting mode of penitence, and of course adds a certain drama to the procession as well. 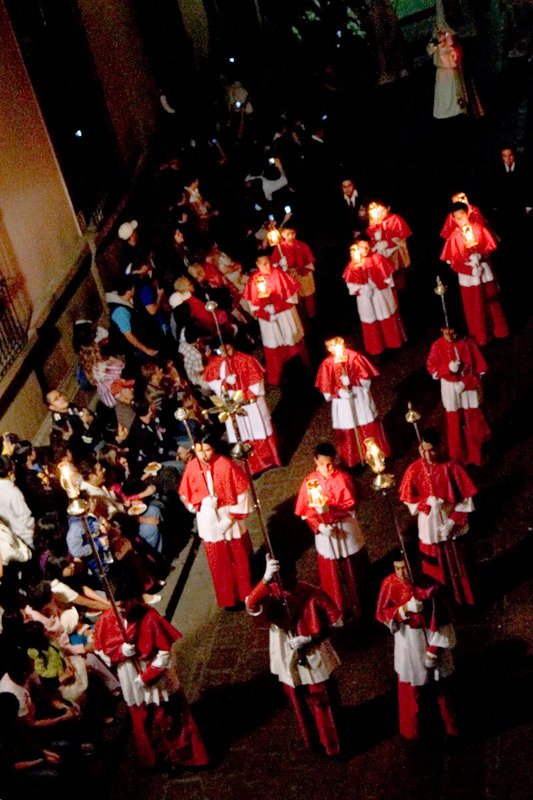 The procession starts at dusk on Good Friday, when the leaders sound a trumpet call, and then the groups proceed silently into the street mourning the Passion and Death of Christ. The lowered lighting in the streets makes way for the faithful carrying candles and only a drumbeat marks the pace. Remarkably, the audience stays pretty quiet too and the overall effect is one of great solemnity and tradition. The first cofradía is the Brotherhood of Carmen with the figure of the Virgin of Our Lady of Solitude, also called “La Dolorosa” due to the sad expression on her face at the impending death of her son. This figure or float, weighing over a ton, is carried by 40 men on their shoulders. The floats all have long legs, so the men can rest when the march comes to a stop. Most of the figures carried are large, and heavy, and this, combined with the length of the procession (a smidgen more than a mile), causes many stops, so the float bearers can regain their strength to continue. The march lasts a couple of hours and wends around the Centro Historico. (To download a map with the route (highlighted in purple), click here.) At times during the procession the “Saeta,” a short, plaintive verse that breaks the rigidity of drums is heard. The last cofradía making the route is “La Soledad,” and its return to the Temple of Carmen marks the end of the commemoration. As you can see from the photos, this is a VERY well-attended event. In fact, everyone warned us that Good Friday and Saturday were crazy in SLP’s Centro Historico, and we were actually glad to have moved to a hotel farther out of the Centro as we’d have to leave the next day, and we didn’t want to get stuck in a giant traffic jam. 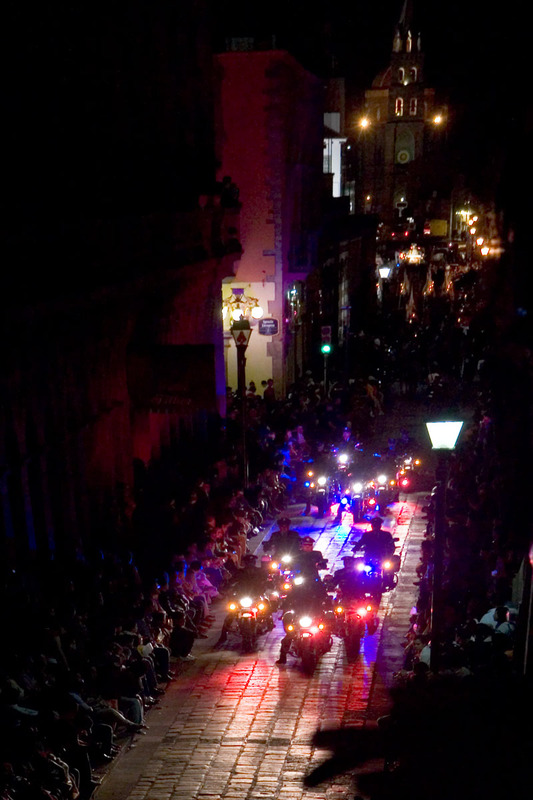 The night of the Procession, we were EXTREMELY fortunate to find a second-floor restaurant on the Procession route with a balcony. Even more lucky for us was the fact that the restaurant was fairly small, with maybe eight tables, so we could pretty much go to the balcony to see whenever we wanted to. Since the menu was prix fixe for the evening (and not very expensive at that), we felt no pressure to leave. So we spent a bit more than two hours in this restaurant, drinking beers, eating dinner, and watching the procession. It was a magical evening. Next up on the Magical Mexican Mountain Town Tour is Zacatecas, a beautiful eighteenth century town built of pink cantera and funded by abundant silver mines. Good info and great photos amigo! I guess you have a quiet camera 😉 No shortage of interesting activities and traditions south of the border. Thanks John. As for the camera, I don’t know about quiet, but I was a floor up, so the click wasn’t that noticeable. Saludos! 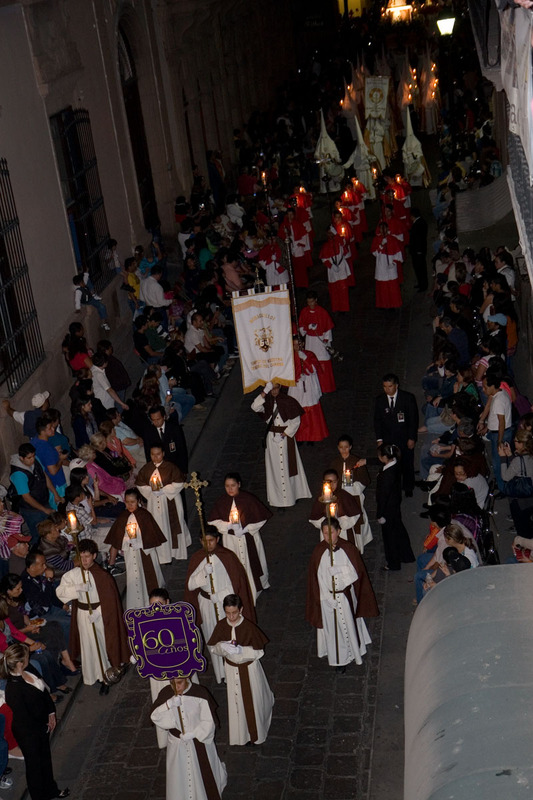 My small Mexican city also has a great Silent Procession. So as not to attract more Gringos here, I won’t mention the town’s name. Sounds interesting. Is it your small city where we met, or where you actually live? Aren’t you the only Gringo in the latter? Saludos. The small city where we met and the small city where I actually live are one and the same. Where I live is simply a neighborhood, a “colonia.” It used to be a separate town, long ago, which is why we have our own plaza and church. The procession takes place downtown where we met. I am not the only Gringo in my neighborhood. There is a couple who live about three blocks away in a house that has seen a procession of Gringos come and go. I just have to say that that was an extraordinary description, Kim; your narrative is superb and one feels transported to the place. I’m also grateful for all those interesting facts that I didn’t know about, especially the capirotes. Although the sight of those people wearing capirotes could be a little disturbing to me, I think that this procession is a beautiful event and a good reason to visit SLP in Semana Santa. So many interesting things happening in other parts of my country, make me think my city is really dull. A local joke says “Poor Monterrey, so far from God so close to US”. Regards! Hola Tino! Thanks for the kind words. Yes, I too was disturbed initially by the capirotes, and it was only upon doing my research that I learned what I wrote in the post. I’ve never been to Monterrey, though my understanding is that it’s a pretty modern city, so it’s not surprising that it doesn’t have some of the attractions of a place like SLP. As for your Monterrey joke, I’ve heard it said of the whole country, but never solely Monterrey, LOL… And despite having lived a few years in Texas, I never once heard the reverse joke about Mexico. Saludos! Oh Kim I love this! Your narrative is excellent – I always learn something from you – and these photos give me the shivers, especially the last one. 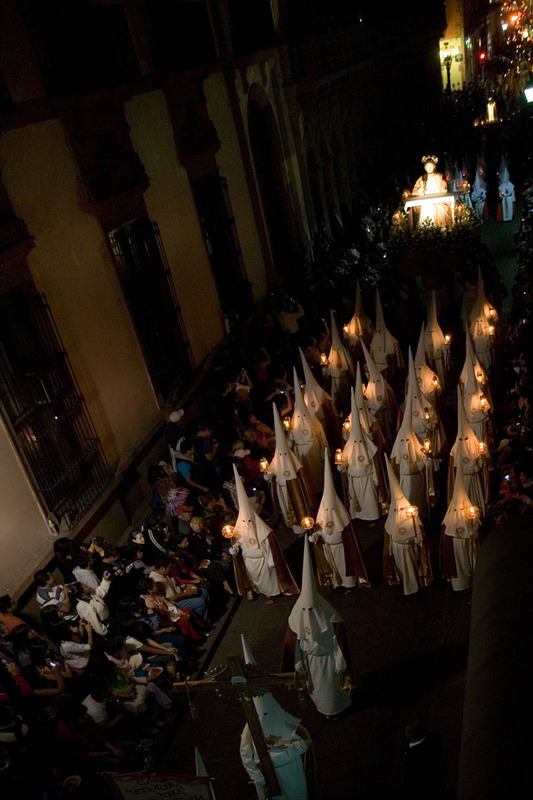 I’ll be in San Miguel for three weeks over Semana Santa which will be my first time experiencing anything like this. You’ve made me even more eager. Thank you for sharing both knowledge and experience! Hi Barbara, Thanks for the kind words. I learned a few things myself, including all that I wrote about the capirotes. In fact, I had to do some searches in Spanish as there was very little available in English about them. And I didn’t want to post the pictures without a better understanding of those hats, especially for an American audience for whom (myself included) the hats have a rather bad connotation. Thanks for reading, and I wish you a fantastic trip to SMA. BTW, as you know from my first post in this series, it’s not a bad bus ride from there to SLP. That said, the best “bang for the buck” in terms of time for you in SMA would be to take a day or two and go to Querétaro (about 1.5 hrs) or Guanajuato (maybe an hour by bus). Saludos! Thank you for the recommendations. Last time in SMA I went to Guanajuato and Dolores Hidalgo. I always fly into Querétaro but have yet to explore it. I’d love to get to SLP. Oh to be honest I’d love to get everywhere in Mexico! I’ve not yet been to your beloved DF. SO much to see and experience. It’s grand isn’t it? Just grand. There’s literally never a dull moment SOB. As much as I’ve praised SLP in the last couple of posts, I think Querétaro is even more beautiful. If you’re going to be in SMA for three weeks, you really owe it to yourself to spend at least a full day in Querétaro. One of these days I’ll write a post on it, but as noted, the only reason we skipped it on the Magical Mexican Mountain Town Tour is that we’d already been there a couple years prior, and we were somewhat time-constrained. Also note that from SMA to DF is about a 3.5 hour bus ride, and definitely the best way to get there. You probably don’t want to try to drive in DF traffic anyway. Saludos. Excellent post, I learned some new stuff. I know now to keep quiet when I see guys wearing long white pointy hats. Thanks, Peter, LOL…. that’s probably good advice in any case. Saludos! I’ve read that Taxco is noted for their Holy Week observances, but I had not heard of this procession in SLP. I’m not a religious person, but it looks like an impressive event. Very interesting post. Hi Bill. 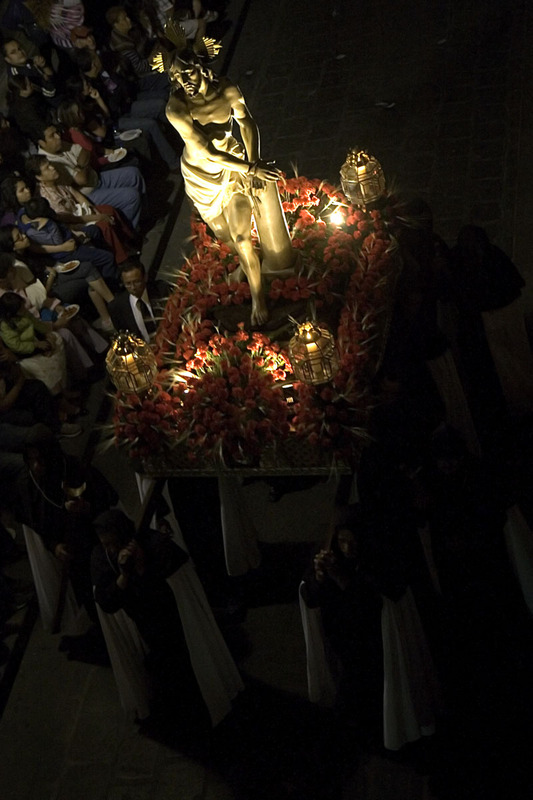 I’ve been to Taxco several times, but don’t recall hearing anything special about Semana Santa. That said, there are some interesting sculptures of penitents/pilgrims there, so a big Semana Santa celebration wouldn’t surprise me either. Saludos! Add Italy to the list of Great Processions. And I will add San Luis Potosi to my list of places to see here in my new country. Yes, Italy has some amazing processions with amazing livery. The Palio di Asti comes to mind. I think I’ve managed to persuade a number of readers that SLP is worth the trouble. And I’ve persuaded myself that I want to go back. LOL… TOO funny. Yes, in Mexico, there’s a lot of lugging around of stuff in processions, particularly around Easter. I think SLP’s Procession is based on the one in Sevilla. Have you seen it? Hmmm….well, you probably know more about that than I do. But I’m sure there’s good food nearby. If not cakes, then at least tapas. LadyCakes, I love your observation. She’s very funny. You should check out her blog.